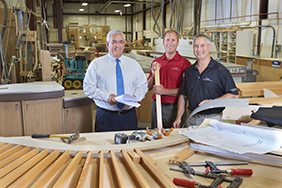 l to r – Mike Vlahos, Vice President, Commercial Loan Officer, Merrimack County Savings Bank with the owners of Aubin Woodworking, Inc – Randy Wasylak, Vice President and Tony Aubin, President. Because we recognize that your life is unique, we are also available to speak with you by phone or in person to help you find the right solution to meet your business goals. We will take the time to understand your aspirations and offer you a choice of programs that will meet your unique needs, now and as those needs evolve. Please contact us for additional rates or more information. *Checking Accounts are variable rate accounts. The interest rates and APYs may change at the discretion of the Bank. Fees could reduce the earnings on Checking Accounts. **Savings Accounts are variable rate accounts. The interest rates and APYs may change at the discretion of the Bank. Fees could reduce the earnings on Savings Accounts. *An active business checking account in good standing is required. Your associated checking account is "active" with 3 or more withdrawals or deposits within each statement cycle. Money Market Accounts are variable rate accounts. The interest rates and APYs may change at the Bank's discretion. Fees could reduce earning. Interest on Merrimack County Savings Bank’s deposits is compounded every month and credited to your account monthly, using the daily balance method. This method applies a daily periodic rate to the principal in the account each day. Accrual of interest on non-cash deposits (for example, checks) begins to accrue no later than the next business day. Please note that all Certificates of Deposit are available as Roth and Traditional IRAs. Please refer to the Account Terms schedule for applicable fees and other details.